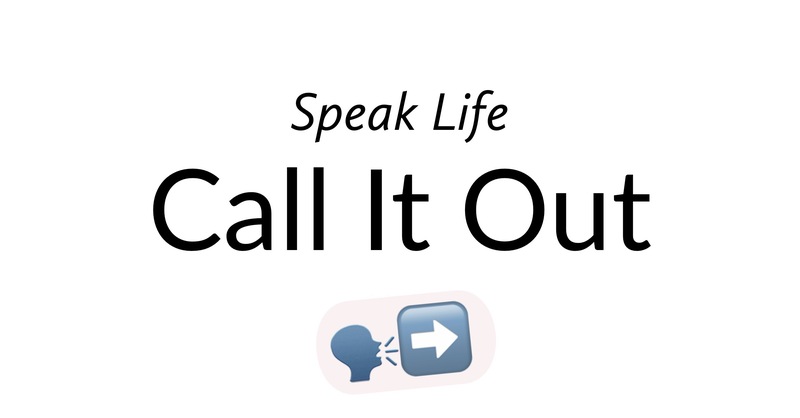 Speak Life: Call It Out – Stew Rd. In Matthew 16, Jesus saw a passionate, but unstable man and called him “a rock” way before he was stable. Peter means “rock.” His name was originally Simon son of Jonah. Simon means “listen” and Jonah was an unstable man who ran from God in the Old Testament. Have you ever had someone give you a compliment or call out the best in you? “Hey, have you lost weight? You look great, you look like you’ve been working out!” Whenever I hear that I want to eat a salad and hit the gym. Why? Because they saw something good and called it out. On the flip side, when I hear “you’ve put on a few pounds” I just want to hit a pizza buffet. Look for even just a trace of good character traits or potential and let them know about it. People often live up to the expectations we put on them. Do you see someone as a blessing or an irritation? We see people through a filter and we relate to them through that filter. If someone believes they are a blessing to you, they will tend to do their best to live up to that expectation. Likewise, if we see someone as an irritation there is a good chance they will probably fulfill that expectation as well. Jesus wasn’t in denial about the “here and now.” He saw who Peter was and declared his identity way before he walked in it. Ask Father to give you eyes to see what He sees in people and call it out! Pingback: Covenant: In it to Win it – Stew Rd.